Do you remember back almost about a year ago? One of the first fundraisers to help with my transplant was a rubber bracelet that said “P U S H.” It was an acronym for “pray until something happens” or some said “pray until Scott heals.” People from coast to coast bought bracelets to wear. They, you, PUSHed for me. This past Saturday I did something crazy. I lined up at the starting line with my water bottle filled and my bike ready to roll. I wore my padded shorts, since we all know that bike seats are torture devices, and I was styling in my “Donate Life” cycling jersey. I definitely looked like a cyclist. I fit right in and no one had any idea that it was just 138 days since I had a liver transplant. No one except for family holding signs and wearing matching Donate Life shirts with “Linscott Team Transplant” written on the back. My wife, quiet, gentle and so very strong, PUSHED and would not allow me to quit. I remember one morning in the hospital when the pain drove me into hysterics. I was swearing, throwing things, yelling and crying. The pain altered my personality. Sobbing, I told Robin I would never make it home again and that I was going to die. I told her I just wanted the pain to end and I begged to die. The complication I was having put me off the pain scale to a state of delirium. She talked about me meeting my grandchildren and spoiling them with ice cream. She redirected my mind and held me while I sobbed. We prayed together like we did so many times before. She PUSHed hard and would not let me give up. So many people PUSHed for me. My parents, my sisters, nephews, nieces, aunts and cousins, my kids. My brothers and sisters through my adoption by God visited, called, emailed and sent cards. My “Love Your Liver” online support group encouraged me to keep fighting. They let me whine, complain and ask questions. I met a new lifelong friend named Bill who PUSHed hard with total understanding. This past Saturday, at about 8.5 miles into the ride, a long, unpaved hill stood before me. I had nothing left. Even though I said I’d celebrate every mile I rode even if I didn’t finish, my heart sank. I wanted to finish but this was it. I was going to have quit. I didn’t even have the strength left to walk. Suddenly I felt my bike pick up speed and my peddle strokes became easy. I looked to my left and saw my son-in-law Jake running along beside my bike pushing me up that hill. Even now my eyes are filling with tears as I write this. 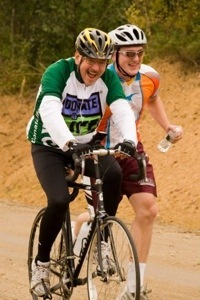 He had ridden the whole way with me at my slow pace encouraging me and talking about how great I was doing. And now, he had jumped off his bike to PUSH me up and over that last hill. He ran back, got his bike and caught up to me. We crossed the finish line together to cheers and tears of family. I rode beyond and circled back so they would not see me crying. Jake was a picture of all of you who have PUSHed for me with your prayers, your emails, cards, phone calls and visits. You have been my strength when I had no strength of my own. You were there in his push. You were there when we crossed that finish line together. God has used you to PUSH me – even those who have never written but only read. You crossed that line with me. Thank you for pushing me forward. Thank you for not giving up on me. I am a blessed man. This entry was posted in discouragement, End Stage Liver Disease, facing death, Fatty liver, Fatty Liver Disease, Find God, Jesus, Liver disease, NASH, organ donation, Organ transplant, pain and tagged bear with one another, bracelet, cancer community center, Christian, chronic illness, Chronic pain, cirrhosis, depression, direction, family, fight back festival, healing, help, hope, Jake Groom, Lahey Clinic, Liver, Liver disease, liver transplant, love your liver, NASH, never quit, organ donation, Pineland, PUSH, quitting, transplant. Bookmark the permalink. 4 Responses to You are so pushy! Thank you. Wow God is so good. Praise God for all He has done. I am so joyful to see a miricle in your life. May you share the love of God to others by your testamony. God bless you and the family. Through my tears I’m giving thanks. Thanks for the love of our Heavenly Father who has brought you through. Thanks for the love he has given you, so that you could teach and inspire your family to so fervently love you. Thanks for your son-in-love; no that is not a typo, it is not law that makes you family, who so gave of himself so that together you could reach your goal. Thanks for all God has taught me through your shared journey. Our God is awesome! !